Le Van Vinh used pieces of shells from 3 million coconuts to make roofs for three houses in central Quang Nam Province's Dien Ban District. is a unique part of an exhibition in Quang Nam Province's Dien Ban District. 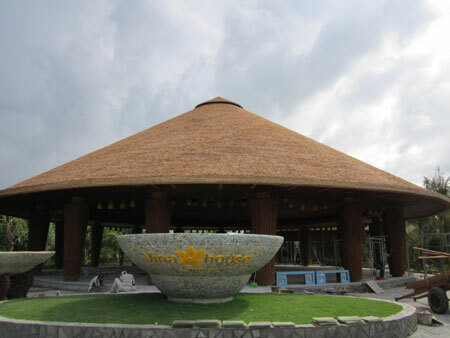 The houses are in a 11,000sq m open museum called "Vinahouse Space" (of which Vinh is the owner), located about 7km from the ancient town of Hoi An. They are among dozens of centuries-old houses from the northern, southern and central regions, creating new tourist attractions. Visitors can bike from Hoi An to the village in 15 minutes. Vinh, 33, said: "I want to restore ancient houses in the country before they are all replaced with concrete and steel. "More and more ancient houses in rural areas are disappearing from rapid urbanisation. The restoration of ancient houses will preserve relics of the farming lifestyles and architecture for future generations. in the Vinahouse Space. 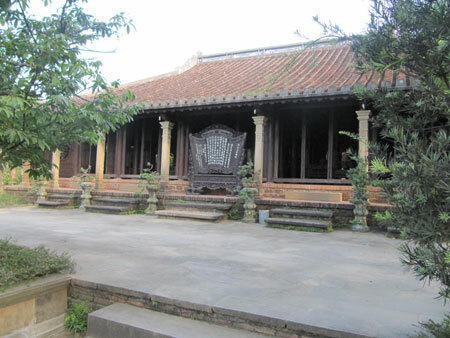 The Ruong house is associated with the old imperial capital in Hue city. "Old houses depict rural behaviour over the centuries, typical countryside houses that tourists rarely see now." Ngo Dinh Tu, a staff member at Vinahouse Space, said: "We spent around 15 years to identify 500 old houses in different provinces, including Bac Ninh, Quang Nam, Hue, Quang Binh and Quang Tri. "We have preserved some of the most typical ones in a small area for visitors to appreciate." The Space also has 2,000 wooden exhibits, including furniture, interior decorations, wood sculptures of old houses and farming and carpentry tools. Le Thi Kim, a guide at Vinahouse Space, said that in the past people in rural areas used wood, bamboo and coconut leaves to make houses. "They planted bamboo, timber and coconut trees or palms in the garden to provide shade and protect them from storms," Kim, 23, said. "Then they harvested them to make their houses. It saved them a lot of money. "Vinahouse Space has restored a Ruong house (built with wooden beams and pillars), which was associated with the old imperial capital in Hue City." The roofs of houses of the ethnic Co Tu group, in the mountainous Tay Giang District in Quang Nam Province, have also been restored. 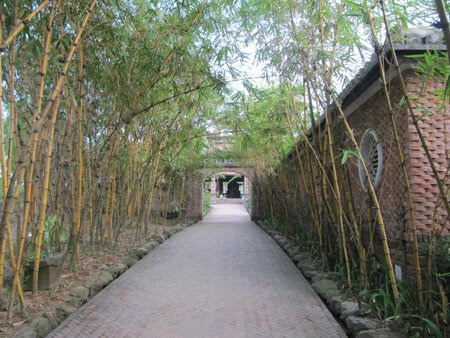 Tree-lined: The path leads to a village gate built using bamboo and brick tiles. They were made from millions of coconut shells, instead of the traditional palm leaves, creating a unique decoration for the location. Vo Van Binh, who worked at restoring one of the roofs, said: "Co Tu ethnic people make their houses with bamboo and palm leaves but we want to create an extraordinary house in the area. "Three houses are built in the shape of a conical hat, which we will preserve. They serve as the cooking area and restaurant." The staff also protect a century-old bamboo house – the oldest in the province. All furniture and kitchen utensils in the house are on display, and visitors can see the ancient wood-fuel stove in action as it is kept burning all day. Nguyen Tran Viet, a tour operator from Ha Noi, said: "I get a great impression from the house with the roof made of coconut shells. "It's an extraordinary design and unique creation which I am sure will lure the visitors." Viet said, however, that the area was very poor and had yet to develop products and recreation activities. His company planned to include a tour of the site as an option. "It's suitable for a half-day tour or a quick visit," he said. Meanwhile, the provincial department of culture, sport and tourism is pushing the Vinahouse Space as more than just a quick visit. They want it to be a new tourist destination in itself, and have included a craft centre to introduce products from nearby Kim Bong Village. Vinh said: "We really need to promote the carpentry of Hoi An. However, the space is quite small for a large introduction of the craft. "We also want to include local art performance and other recreation activities." Kim said cooking classes were already operating as part of the push for diverse attractions, and proving an ideal introduction to the local cooking. "We introduce my quang (local rice noodles) and barbecued Cau Mong veal – two specialties of Quang Nam Province," she said. Vinahouse Space, which debuted last month, is expecting at least 600 visitors a month.